Google has revamped its portfolio of enterprise cloud services, by cutting prices, adding new features, and touting a refreshed enthusiasm for the cloud market. "We have been very seriously committed to the cloud as a business and product family," said Greg DeMichillie, Google director of product management. "If you look at what we're doing, you can see how committed we are to this space." Google now runs over 4.75 million active applications on its services. Google App Engine fields 28 billion requests a day. And Google cloud storage services execute 6.3 trillion operations per month, according to the company. The company has made sizeable price cuts across its storage, compute and BigQuery analysis services. It has also introduced a number of new services, including managed virtual machines, an extension of BigQuery for live data and the ability to run copies of the enterprise-ready Red Hat Enterprise Linux, Suse Linux and Windows Server 2008 R2. Collectively, these announcements show that Google may be coming to understand that "they really need to step it up," in the market for cloud computing services, said John Rymer, Forrester Research's principal analyst covering application development and delivery. In a recent Forrester survey of developers, Google trailed Amazon Web Services (AWS) and Microsoft Windows Azure, in terms of preference for future development. About 42 percent of the developers picked AWS, and 33 percent chose Azure, while only 28 percent chose Google. Until now, AWS and Microsoft have both been ahead of Google in terms of courting developers, Rymer pointed out. Google's collection of enterprise cloud services has not been as broad nor has had the same breadth of features as AWS's or Azure's, Rymer said. "Google's focus on developers hasn't been as maniacal," Rymer said. He expected that the new price cuts and additional services will be the first in a number of moves the company will make this year to gain a better foothold in the market. For its storage services, Google has cut prices as well as simplified the pricing. Cloud Storage is now priced at US$0.026 cents per GB per month, and $0.020 cents per GB per month for an option with reduced availability, regardless of the amount of data stored. Formerly, the company had a number of pricing tiers for storage, based on the amount of data being stored. Prices previously ranged from $0.085 per GB per month to $0.054 per GB per month. Using Google Compute Engine (GCE) will now cost, on average, 32 percent less than it did before. A standard GCE instance cost $0.070 per hour, a reduction from the former rate of $0.104. 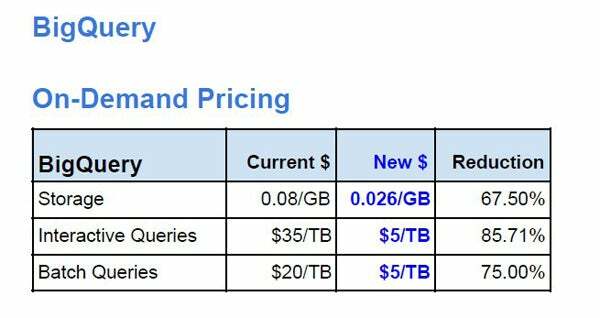 Google BigQuery on-demand had prices reduced by up to 85 percent. Interactive queries now cost $5 per terabyte to process, a reduction from $35 per terabyte. Batch queries now cost $5 per terabyte to process, down from $20 per terabyte. The company is also adding in automatic discounts for the sustained use of services. Using a GCE constantly for a month could reduce the bill by as much as 53 percent, DeMichillie said. DeMichillie vowed that Google will continue to aggressively cut prices to reflect declining hardware costs in the industry. Overall, hardware costs can decrease by 20 to 30 percent annually, as each generation of processors, memory and storage come with greater capacities. While Amazon Web Services and Microsoft have routinely cut the prices of their services, DeMichillie argued that the cloud services industry as a whole does not keep pace with the falling hardware prices. Cloud services prices, on the whole, fall only eight percent per year, he said. The company also unveiled a number of new services as well. It has launched a new type of virtual machine (VM), called the managed virtual machine which allows a user to move an application built on Google App Engine (GAE) into a full IaaS (infrastructure as a service) VM. PaaS has some limitations in that if a user needs a programming language or a database or some other tool that isn't offered in the PaaS environment then "you are stuck," DeMichillie said. The new offering allows the user to migrate a Google PaaS into a virtual machine, which provides an environment to add the additional required tools. "You get the flexibility of a VM environment, but also the auto-management capability of GAE," DeMichillie said. "The software that you previously had running on an app engine back end will now run on a virtual machine with other software." Also, the company has opened BigQuery data analysis service to be able to accept live data streams as well. It can ingest up to 100,000 rows of data per second. For the IaaS space, the company has introduced a number of new operating systems it can offer, namely Red Hat Enterprise Linux, Suse Linux and Microsoft Windows 2008 R2. The company has also launched a cloud DNS (domain name service) for enterprises that wish to outsource that function. For developers, it has integrated the GitHub online code repository to its own consoles.